Look at the sustainable feature of this unique modern home. Do you think that sustainability is one of the most important elements to consider in building your own house? What do you think are its essential benefits? We can never deny the fact that many homeowners considered sustainability in building their houses. For them sustainability comes with comfort and ease. The natural resources that surrounded the house enhance the look of the interior as well as the exterior. Also it can help in reducing the electricity consumption in the house. Today, we will explore how the designer maximizes the aspects of sustainability in their designed house. 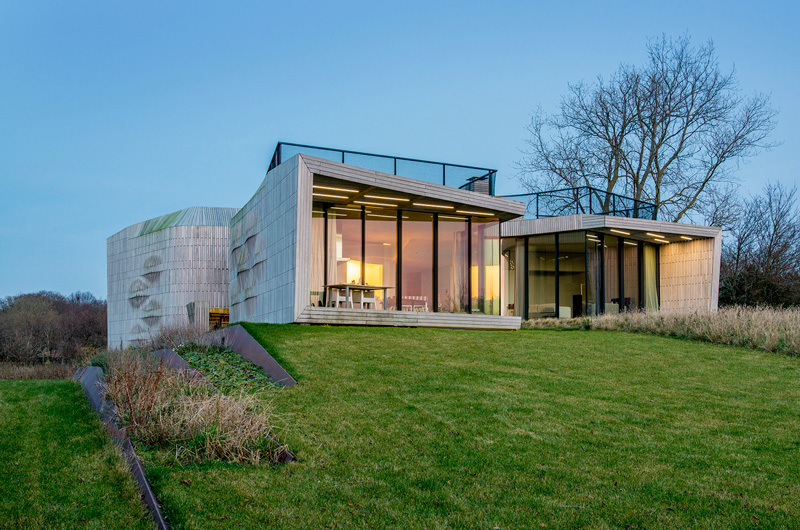 This house is named as W. I. N. D. House, it is a private residence completed in the year 2014 which is situated in North Holland, The Netherlands. Unique feature: This house projects the unique house shape, patterns and texture. 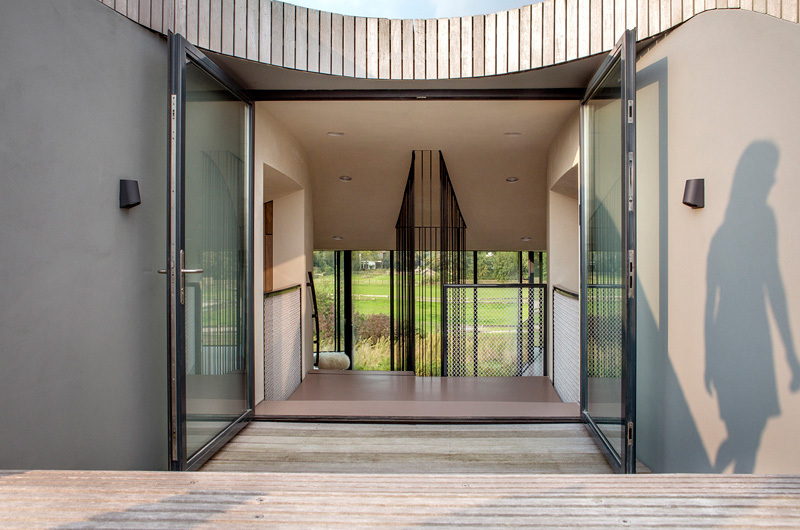 Also this house becomes unique and attractive for its automation and energy management proves the sustainable source from the wind and sunlight. This home automation system enables the control of the electrical systems which includes solar panels and mechanical installations. The incredible shape of the house building jives with the location. 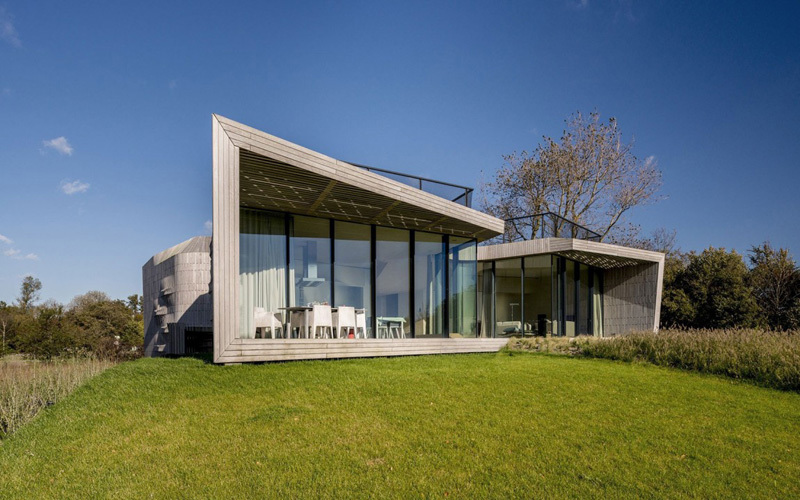 Beautiful landscape explains the importance of nature in designing and building this house. From the garage, the contrasting textures are highlighted from the walls and floors of the entrance. Lines and patterns are amazingly described in the walls of the house building and plants here. 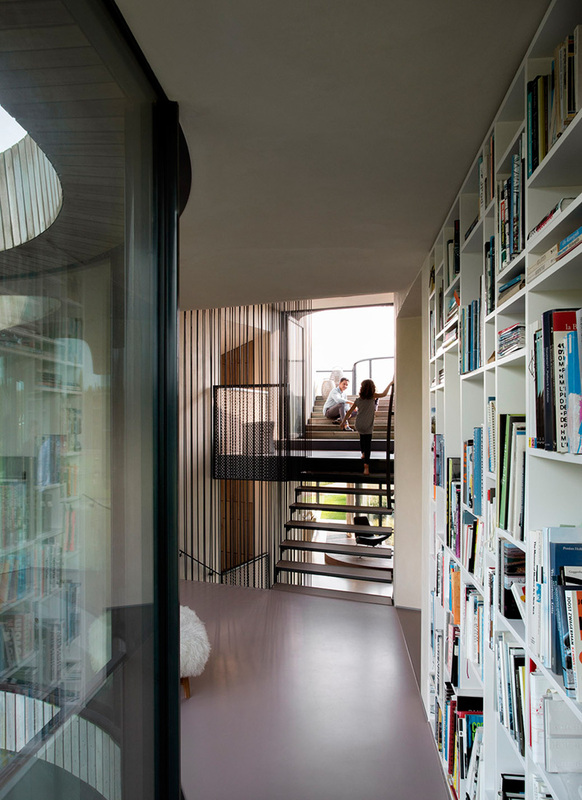 Take a look at how the designer made sure the natural light and natural ventilation is accessible even inside the house. Glazed doors and window is enough to allow the client to experience the remarkable natural experience in the interior. Let us carefully see how the designer managed to make the staircase complement with the other shapes and forms in the interior. The amazing curves and edges found here may simply underline its elegance and luxury, too. Built-in shelves are enhanced the look of the walls of the interior. This also provide a graceful and well-oriented space in the house. In the morning, the client may take the full advantage of the panoramic views through this glassed walls and sliding doors here. See how the furniture blended well with the concept of the interior design. Soft and beige sofa are well arranged in the living space with this square table at the center. The edges of this sofa jives with the carpet at the heart of this area, too. 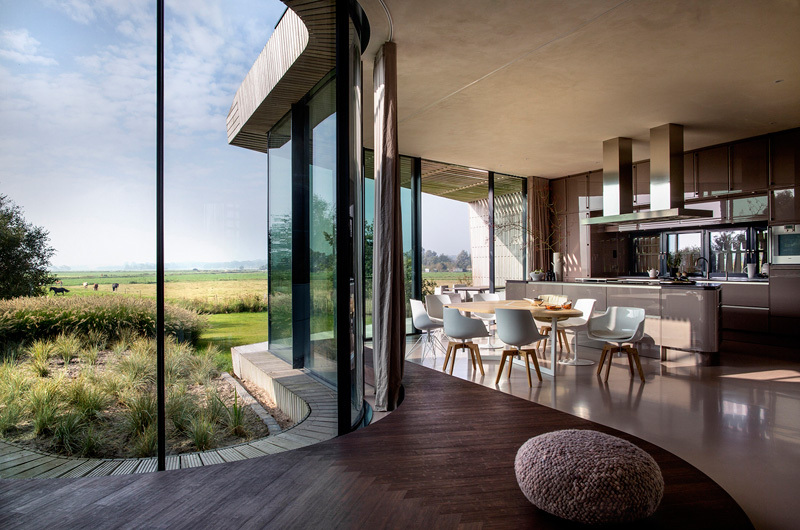 While enjoying the panoramic scenes in this area, the homeowner may still do some of their basic routine in the kitchen. LED lights installed in the ceiling of this bedroom and bathroom is effective in setting up the romantic mood and proves that this space is luxurious. A spacious terrace is enough for the homeowner and his family to enjoy the sustainable features of the house. The glamorous landscape adds a captivating look of the house. 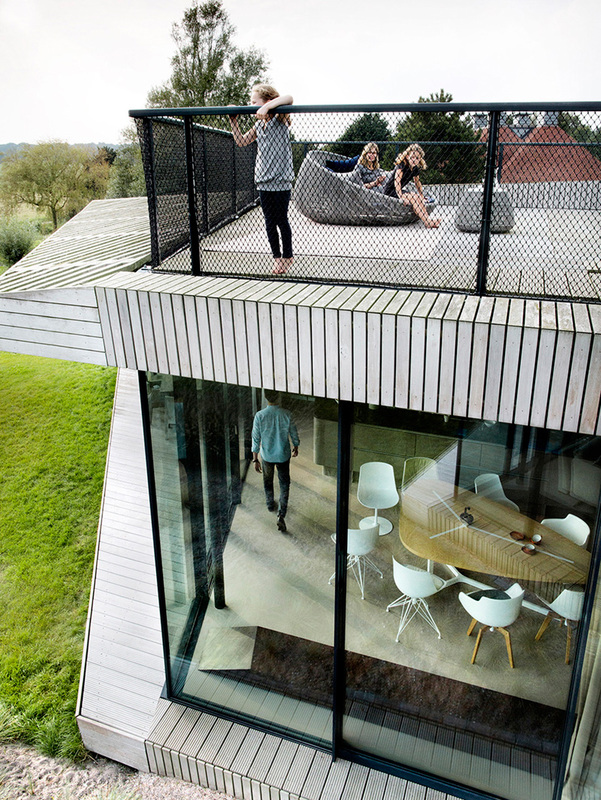 From this angle you can see the captivating and relaxing space in the terrace and the living space. You can see how the designer established a strong connection between the indoor and outdoor spaces. A different texture displayed in the house building explains why elegant and extraordinary style is important. 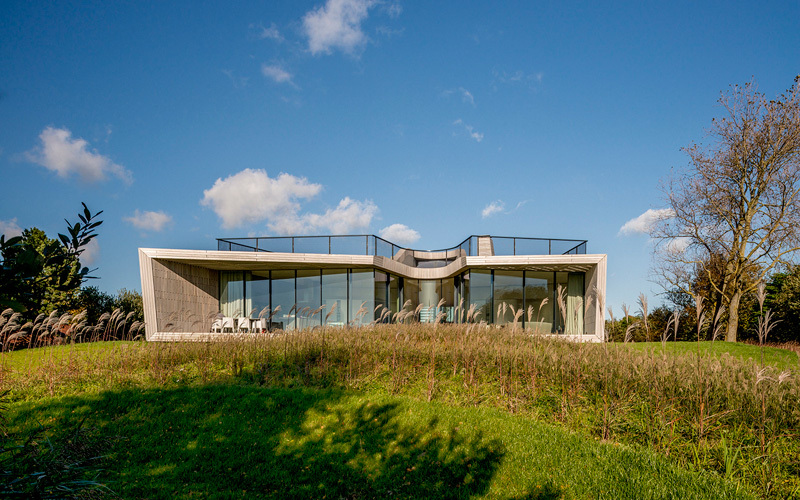 Geometric shape of the house building stands out in this neat and well-groomed landscape. The plants and trees provides the high rate benefits for the home design. Remarkable lines and patterns in the house building underline its modern and contemporary design. Its unique shape made this house fabulous and charming. The LED lights in the interiors graced the exceptional style and concept utilized in this house. The homeowner may certainly feel the relaxing mood even in the interior. As we have seen the different spaces of this W.I.N.D. 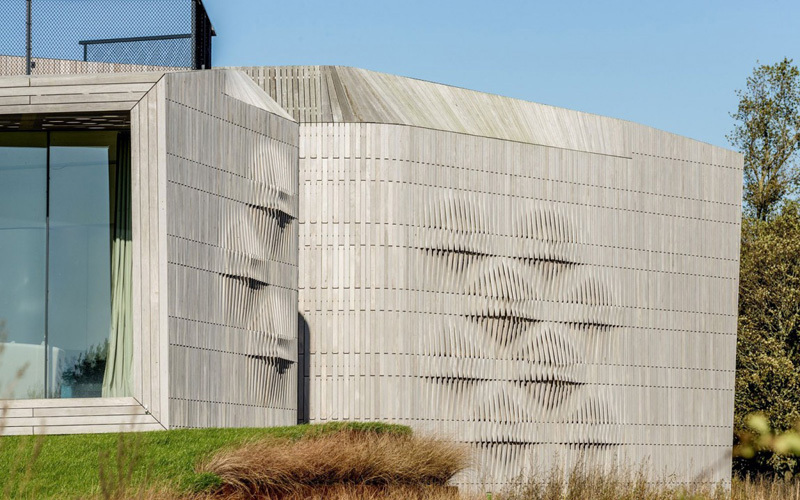 House, we can see that the UNStudio exerted their effort in maintaining the important contribution of sustainability. 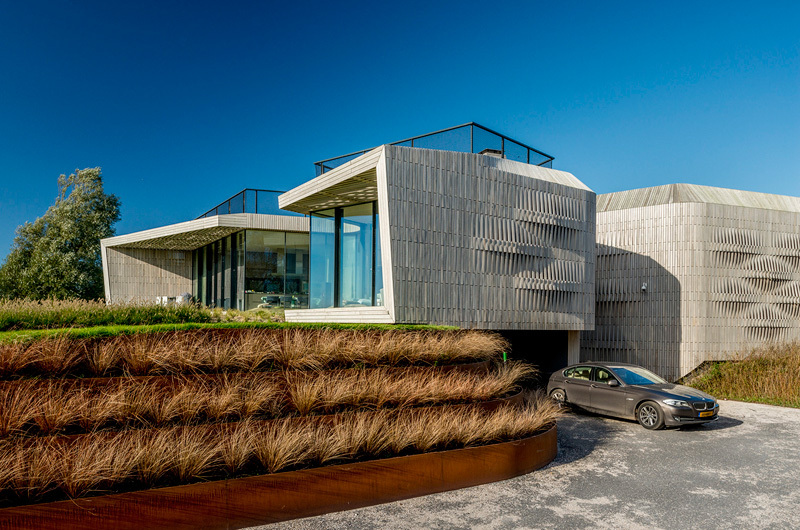 Its automation and energy management proves that sustainable source from the wind and sun can be of great help in the client’s house. This comprehensive home automation system enables integrated control of the electrical systems which includes solar panels and mechanical installations. Also there is a complete control of this smart home which is possible by a central touch-screen in the living area, while decentral devices provides the dedicated control per room. However, the said control is possible remotely by independent devices via local area network connection. Then we can say that this features is a great model if you are searching for a sustainable and smart home in the future.